It is becoming increasingly obvious that our connected computers will be more a "part of us" than ever before. Many are quick to dismiss wearable technology such as Google's Project Glass as a parlour trick and some are already calling those who use them "glassholes." The Post-PC world will not be kind to advertising as we have known it. There are two trains of thought here that are important for media professionals to think about as we move forward into a world where screens are ubiquitous, cheap, connected and virtually everywhere. Train of thought #1: Screens everywhere means advertising everywhere. This is the Minority Report scenario. Connected screens that are either physical or simply appear as heads up displays that know who we are based on quick retina scans of our eyes. All advertising is highly personalized and customized to match our experiences, wants, desires and more. Screens are also motion/touch sensitive so that consumers can interact, move and access more information through them. It seems chaotic, ridiculous and science fiction-y to even think about this world, but it also seems somewhat plausible as more and more screens get connected and more and more devices start having connected screens in them (think about major home appliances and more). Train of thought #2: The main screen is the screen we wear. While still nascent, wearable technology is all the rage these days. From Nike FuelBand to Jawbone's Up and the pending public launch of Google's Project Glass and whatever Apple has up their sleeves for their own wearable technology, it is becoming increasingly obvious that our connected computers will be more a "part of us" than ever before. This won't just be devices or destinations for use as needed, but integrated into the very fabric of our clothing and accessories. If we are all sporting our own heads up display that puts a screen in our faces whenever and wherever we need it/want it, maybe the rest of the the physical world won't have a need for screens on every kind of surface? And, if they do, perhaps those public screens simply interact with and augment the wearable technology's screen and experience. Crystal balls never looked so interesting. Regardless of which train of thought becomes our virtual reality, we are beginning to see the technology companies that we know and love (Google, Apple, Amazon, etc...) all starting down the path of wearable technology. Back in February of this year, I had the chance to try on Google's new Project Glass and the experience profoundly changed the way I think about technology and how we connect to it. While many are quick to dismiss this form of wearable technology as a parlour trick and some are already calling those who use them "glassholes," we are missing the bigger picture. This is new technology. Any new technology will find its fair share of criticism. We're quick to call people wearing these devices glassholes, but we're equally quick to forget how many found the use of mobile phones in public socially unacceptable not all that long ago (and yes, those are the same people who now speak freakishly loudly on their smartphones in the most inappropriate places). 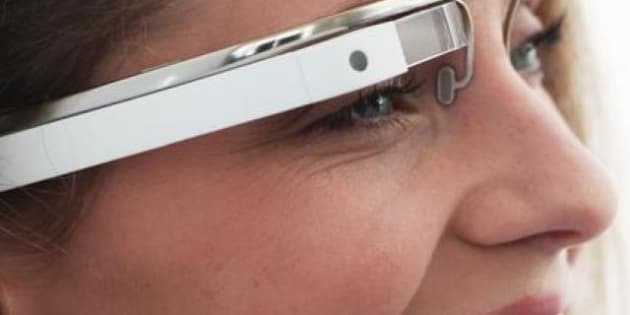 What makes Google's Project Glass so fascinating is this: the connected device is no longer about using your hands and fingers to manipulate it. It is now all about using your eyes and voice to navigate and engage. Ultimately, the experience of wearing Google's Project Glass moved technology from hands and touch to eyes and voice. It is profound, but it will get even more profound. From a business perspective, it has been reported, that Google will not be allowing advertising in the apps that are being developed for Google's Project Glass. As Technology evangelist, Robert Scoble, points out: "This is a huge shift for Google's business model. I believe Larry Page is moving Google from an advertising-based company to a commerce based company." This business play makes perfect sense. Why charge for advertising when you can earn more revenue as a master affiliate? Advertising is a supporting revenue stream for content, but in this very different world -- where voice and eyes are creating and manipulating the experience -- why wouldn't Google take a commission-based approach to successful experiences from making reservations to full on transactions? The ability to be connected at a social level (through Google +, Twitter or Facebook) coupled with a connected virtual wallet that can facilitate micro-payments also makes this business strategy that much more interesting (and lucrative). But, from an advertising perspective, this creates a very different world than the one that is littered with screens just itching to dash a message in front of us, doesn't it? It also engenders a world where screens that do have advertising may be able recapture a core component of what makes advertising work in the first place: scarcity. With screens everywhere and ads everywhere we enter into the world of abundance in terms of inventory. If, suddenly, the majority of our content is being consumed through wearable devices where subscriptions, transactions and more are where the revenue is made (but is free from ads), perhaps when screens do have advertising on them, it is not only more relevant to the consumer but much more valuable to the advertisers buying the space? What kind of marketing world do you think we're going to see? Mitch Joel is president of Twist Image. HIs first book, Six Pixels of Separation, named after his highly-successful blog and podcast of the same name is a business and marketing bestseller. His next book, CTRL ALT Delete, will be in stores on May 21, 2013.